BT TV subscribers have acted angrily to confirmation of a price hike to access Sky Sports content from August. The move, due to take place on 20th August 2017, will see viewers served with a price increase of between £5.50 for SD and £6.50 in HD. For subscribers, the increases will come as a second blow in as many months, timed to come into effect just over a month after a change to Sky Sports which is resulting in customers losing the option to subscribe to either Sky Sports 1 or 2 or both. It comes as Sky changes its sports channels, replacing existing services with themed channels. Effective 18th July, Sky Sports 1 and 2 are replaced on BT TV by Sky Sports Main Event and Sky Sports Extra - a special cut-down channel being distributed on BT TV for the purpose of making Premier League matches not shown on Sky Sports Main Event available to BT TV subscribers. The cost for Sky Sports Main Event and the Extra service will total £27.50 a month in SD - the same price Sky is charging its subscribers for access to all of Sky Sports channels in SD. BT TV subscribers wanting to access Sky Sports content in HD will pay £33.50 a month from 20th August 2017. BT and arch-rival Sky have thus far failed to reach an agreement on providing the full suite of Sky Sports channels on BT's television platform, leaving BT as the only major pay TV platform without full access. 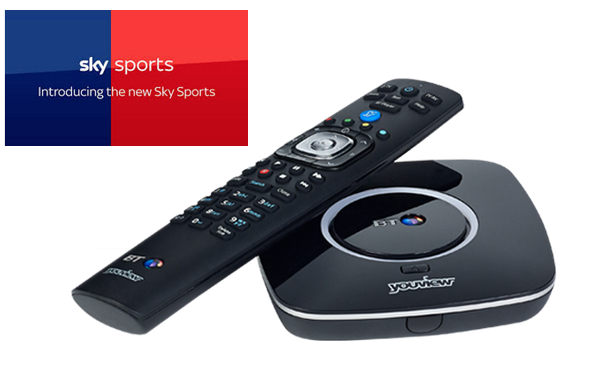 Previously regulator Ofcom has had to intervene, forcing Sky to offer Sky Sports 1 and 2 to other operators. It has since backed off, following the establishment of a regular carriage deal to carry a cut-down Sky Sports service on BT. The addition of Sky Sports Extra, effectively providing part-time access to Sky Sports Premier League content is widely seen as an olive branch to avoid attracting Ofcom's interest. Across social media and internet forums, affected BT TV subscribers have been less than impressed with the changes announced today, which will make access to major sporting events covered by Sky dependent on whether or not an event is shown on Sky Sports Main Event. With a price rise of up to 25% added, some say they will consider using Now TV's Sky Sports pass, which provides access to all Sky Sports channels from £6.99 a day, £10.99 a week or £33.99 a month, depending on how much sport they watch. The Now TV streams are offered at up to 720p resolution, depending on device and internet connection, seen by many as half-way house between regular SD and Full HD. BT says that despite the changes, its customers will still get live access to the Premier League games shown on Sky Sports Main Event and Sky Sports Premier League this season. It also points out that subscribers can also look forward to lots of brand new sport with Sky Sports Main Event including "England Cricket, England Rugby Union Internationals, The Open Golf, and much more".